As a giant monster, stomping cities is what you do. But now, other giant monsters are moving in on your turf! King Kong! Godzilla! Well, their uncopyrighted equivalents anyway, Stomping, mutating and bashing the military as they criss-cross America doing as much damage as they can. Dice rolling and a big slugathon at the end. 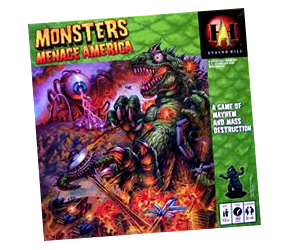 Some say it’s strategic, some say it’s a dicefest, but the theme and the painted plastic monsters can’t be beaten!